To qualify for the National Red Ribbon Week Photo Contest, families and schools were invited to decorate the front of their homes and campuses with a double-looped red ribbon and the words of this year’s Red Ribbon theme: Life is Your Journey. Travel Drug Free, followed by submitting a photo of their decoration to redribbon.org. The Contest, which is co-sponsored by the Drug Enforcement Administration, was held in conjunction with the 33rd Annual National Red Ribbon Week. Paola Stauffer, dean of students and character education coordinator at Orlando Science Charter, said the best part of the contest was “bringing the community together and the challenge of gathering so many for one goal. 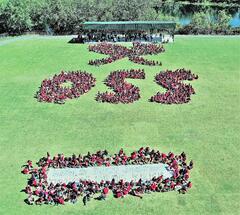 We had almost 1400 people in the picture including parents, staff and students K-12. The challenge of writing in the field and putting the message together was interesting, but working as a team made it happen."